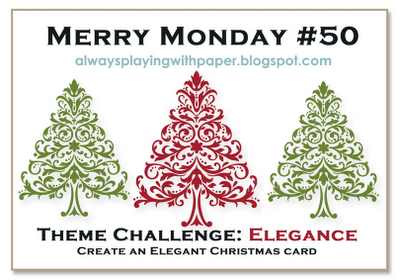 Today's card combines my 2 favorite Christmas challenge blogs, Jingle Belles and Merry Monday. The sketch is this weeks challenge over at Jingle Belles and is brought to us by guest star Brenda Barton. The Merry Monday challenge is to create an elegant Christmas card. I'm not going to lie, both of these challenges were a bit hard for me. I just couldn't seem to decide on how I wanted to go forward with the sketch. 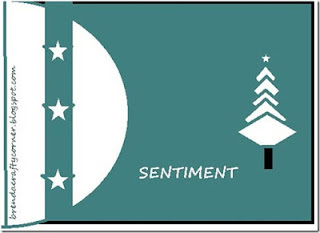 I ended up choosing a tree image from one of my favorite sets, Evergreen. The tree is made up of the lyrics to the song Silent Night so I chose to leave off the sentiment area that's show in the sketch. I also used silver stretch cord in place of the strip that goes down the left side. I especially found the elegant part difficult, as the definition of elegant can be quite subjective and dependent on who you are talking with. For me I often see elegant as something simple, not overwhelming, and with silver or gold involved. I included the silver star and silver cording but didn't want to overdo it with silver either. I don't know if I'm really happy with this card....my daughter said its definitely a "Lisa card", so she sees something of my style in it, but I don't know...I may have to give it another go with both of these challenges. Oh, your card is beautiful - LOVE the blue and embossed half circle! I think you've captured the elegance, Lisa! 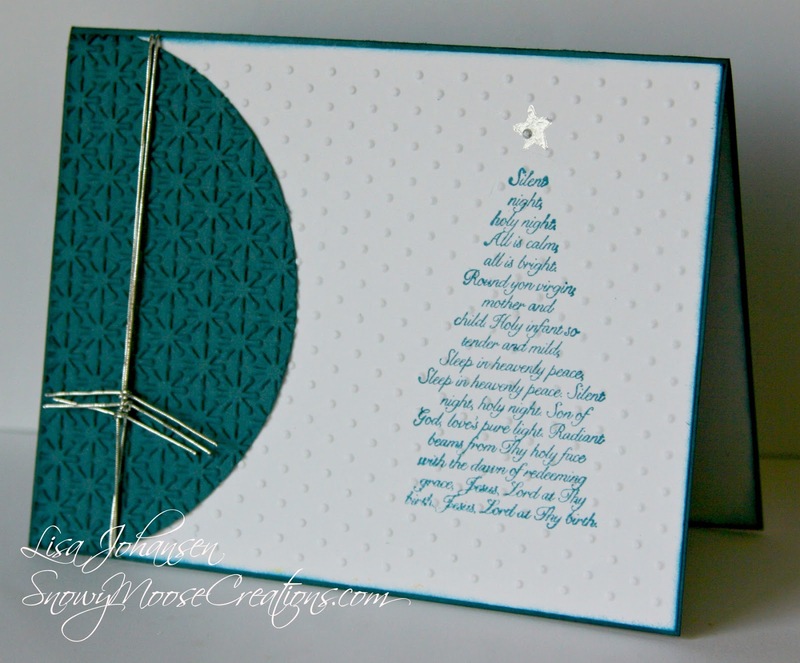 The embossing really dresses up the half circle and I love the bit of silver! Thanks for sharing this with us at Merry Monday! LOVE THIS! You knocked my socks off with your gorgeous and very elegant interpretation of my sketch. I love all the textures that you included. Well done! Beautiful, soft and elegant Lisa, just lovely. Thanks for joining us at Merry Monday. Love the paper color ... texty tree ... and elegant accent wtih the silver cord ... stunning holiday design ... so very glad you got sketchy with us at jingle belles. I love your Christmas card Lisa! There is so much elegance in the two colours you've used to create your card! Thanks for joining us at Merry Monday this week! Fantastic card, these are great colours. Thank you for joining us for Merry Monday this week.